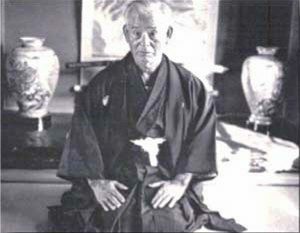 Hohan Soken was born in Okinawa in 1889, the Great Grandson of Soken “Bushi” Matsumura. The Imperial Court’s removal of Japan’s king and the destruction of the feudal system caused hardships on Soken’s family. Even though they were born samurais, his family had very little money after the purge and had to work in the fields. 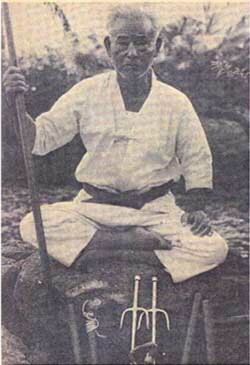 Soken’s uncle, Nabe Matsumura, “Bushi’s” Grandson, was one of the top karate masters at the time. He offered to tutor Soken in Bushido, “the way of the warrior,” if he could demonstrate patience and control benefiting the samurai heritage. He began training with Nabe Matsumura at age 13. He was instructed in the arts of karate and kobojitsu (use of weapons). He would work in the fields during the day and study karate and kobojitsu in the evening. As he grew, the training intensified. 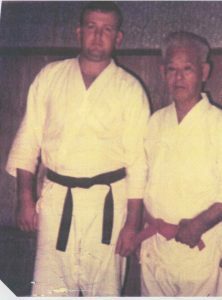 When Hohan Soken was 23, his sensei told him that he was ready to learn “real” karate. He had been drilled in fundamentals for ten years. Now Nabe Matsumura decided Hohan Soken was finally ready to learn the ancient secret of Hakutsuru, the White Swan. Many men coveted the knowledge of this technique. But Nabe Matsumura refused to teach them because of the deadly potential of this technique in the hands of careless men. Even Gichin Funakoshi, who introduced karate to Japan, was refused by Matsumura after he asked to be taught the White Swan. It is believed Matsumura declined because he wanted to confine the knowledge of this deadly technique to his family. To practice the control of the White Swan, Hohan Soken would mount a board and then push the board out onto a pond. After much practice, he was able to perform kata on the board. And later, kumite (sparring) with his sensei, who balanced on another board on the pond. He practiced on the board in all kinds of weather. Hohan Soken left Okinawa in the 1920’s and lived in Argentina until the end of World War II. While there he became fluent in Spanish. After returning to Okinawa, he continued conducting demonstrations to the public. The public demonstrations were frowned on by Okinawan traditionalists. There were few groups who thought the art should be hidden from the public and kept secret. 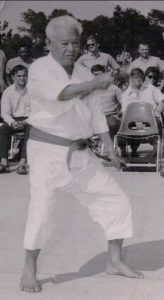 Soke Dave Shelton was a personal student of O’Sensei Hohan Soken, on Okinawa, when he was stationed at Kadena Air Force Base, during the Viet Nam Conflict 1967-69. O’Sensei Hohan Soken passed away in November of 1982 at the age of 93.